We at Toronto350 would like to express our profound gratitude and support for the people who took peaceful action to stop the flow of the Enbridge Line 9 pipeline on December 21, 2015, on Anishnaabe territory near so-called “Sarnia.” These people, rooted in their communities and committed to organic farming, environmental advocacy and challenging violence against women, courageously defended their communities, and all of our communities, after having exhausted all legal avenues. They are also not alone in judging this to be the only way for indigenous and democratic voices to be heard. 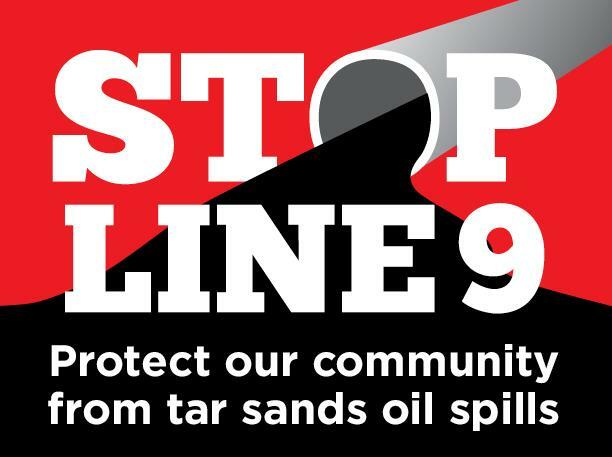 Three Quebecers engaged in a similar action earlier this month to stop the flow through Line 9. These are worthy and legitimate forms of dissent. The absence of valid consultation and consent from First Nations and other impacted communities, the impacts of tar sands exploitation, the state of this forty-year-old pipeline and the lack of serious measures to ensure its secure operation are some - but not all - of the reasons to denounce the recent reversal of the flow of this pipeline. Line 9 crosses numerous tributaries of the Saint Lawrence river, including the Ottawa river and the Rivière des Mille-Îles, putting the drinking water of three million people at risk. Richard Kuprewicz, an American expert in pipeline security, has predicted that there is a 90% chance of a significant spill in the first five years of Line 9’s operation. Communities have used all traditional and legal means available to express their dissent, including numerous appeals to elected officials. Yet the government bodies who claim to protect the population have gone ahead with this project. At the federal level, even after making election campaign promises to revise the National Energy Board (NEB) pipeline evaluation process to be more transparent and democratic, the Trudeau government has thus far remained inactive on this issue. The people have the full right to accuse the federal government, the NEB and Enbridge of putting lives in danger, and to take action when these bodies fail to fulfill their responsibilities. We assert that all those who are concerned about the safety and well-being about the land, water and life, have the right to defend our communities from this disastrous project. When people decide to undertake such actions at the risk of being criminalized, it is only because a serious situation demands a serious response. Protecting Mother Earth is not a crime, it is a responsibility. The energy company Enbridge is hoping to reverse the flow of an oil pipeline, 'Line 9', so that it can carry tar sands crude from Sarnia to Montreal. If the project is approved it would, for the first time, allow dirty crude oil to be pumped through Toronto, as well as many environmentally sensitive areas in Ontario and Quebec. View Environmental Defence's graphic. The chance of an oil spill in this aging pipe, given the corrosive nature of tar sands crude oil ("hot liquid sandpaper"), is very high, nearing certainty. An oil spill could be devastating not only for fragile ecosystems and rare species in Ontario, but would also threaten the drinking water of the city of Toronto. We do not believe Canada will become an energy superpower by exploiting the tar sands, as energy in the 21st century must come from carbon-free sources, not carbon-intensive sources that are tied to deforestation and desertification. Therefore, we are working to oppose the approval of the pipeline's reversal, as it can only damage Toronto, the provinces, Canada and the planet. The heads of the four major oil and gas lobby groups request that the Harper Govt change the law to benefit them. Simply put, they believed that environmental laws were too focused on protecting the environment and they wanted this changed. This was only found out a year later by an Access to Information Request by Greenpeace. Stephen Harper and the Conservative Govt push through omnibus budget Bill C-38. This bill removed the legal need to conduct Environmental Assessments of pipeline projects, smoothing the way for Enbridge's Line 9 pipeline reversal proposal. It also changed the National Energy Board process, to restrict public participation and expedite the proceedings. It contained many of the law changes that the fossil fuel lobby groups had requested ("demanded") a few months before. This omnibus budget bill was criticized strongly by Canadians from nearly every sector of society: all opposition parties, academics, First Nations, charities and the media. Although the bill received over 700 suggested amendments, the Harper Govt refused to accept any changes to the bill, and forced the bill through parliament. The Bill became known as the Environment Devastation Act. The NEB "rubber-stamping" process begins. The List of Issues specifically states: "The Board will not consider the environmental and socio-economic effects associated with upstream activities, the development of oil sands, or the downstream use of the oil transported by the pipeline." Toronto350.org responds to the List of Issues, asking for changes. The NEB ignores all of our requests. We send out a press release, which, along with press releases from other groups, declares the process illegitimate without the changes being included. The NEB releases its anti-public "Application to Participate"
The application form is part of a 23-page PDF, of which the application form itself is 10 pages, and requests both DV and references. There is a two-week window in order to complete and submit the application form, through whichToronto350.org applies to comment. Again, the NEB process is criticized for being anti-participatory. For a TedX talk about "Redefining Apathy" - it's not that people don't want to participate and have a voice in these issues, it's that the process intentionally excludes participation and puts people off. Read Toronto350.org's Line9 Letter of Comment here. Toronto350.org had a block in the rally (pics), which marked the final day of the NEB's so-called public participation process.